In 1923 the Karelian Temporary National Liberation Government-in-exile instituted the Karelian Commemorative Medal. 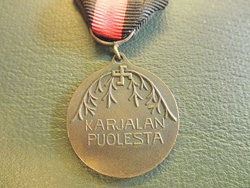 It was awarded to Finnish citizens – participants of the East Karelian Uprising in 1921-1922, as well to those who actively contributed to them. Circular bronze medal was created by Finnish artist Ilmari Wirkkala. The face size within a ring inscribed ‘Not in Words, but in Deeds’. The reverse size inscribed ‘On behalf of Karelia’. The diameter of the Commemorative medal is 28 millimetres. 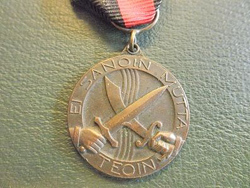 The medal is attached to a black ribbon with a red stripe in the middle. The number of awards by the Karelian Commemorative Medal was about 2500 people. On September 6, 1927, the President of the Republic of Finland Lauri Kristian Relander confirmed that the medal can be worn on the military uniform of the country's Defence Forces.